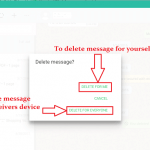 You are here: Home / Delete Social Media / How to Delete Twitter Account? Twitter retain your data for 30 days from the date of deactivation, after which they will begin the process of deleting your account from their system. Once deleted from the system, your account can’t be reactivated. You can reactivate the Twitter account anytime during these 30 days by logging into the Twitter account. Deactivating/reactivating Twitter account won’t solve any problem like disappearing tweets, decreased followers, etc. 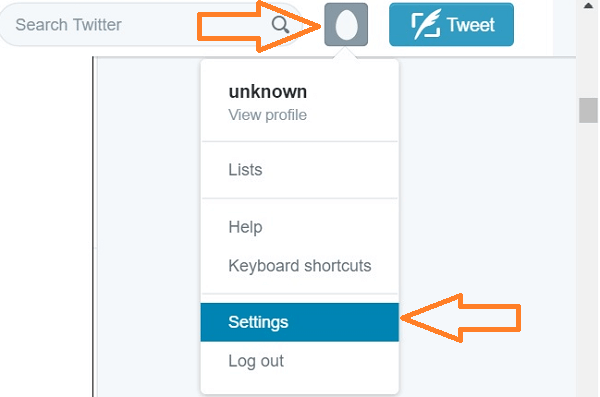 You do not need to deactivate your account to change the username or email address associated with Twitter. You can change them from setting. Bing/Google may show your tweets as Twitter can’t remove items indexed in search engine. Once you deactivate, all data associated with your Twitter will be lost. So be careful while permanently deleting a Twitter account. Step 1: Go to a Twitter website from any web browser you prefer. It is sad to know that you cannot delete Twitter account using an application on your smartphone. So if you want to delete the Twitter account, you have to get a PC or Laptop, or you have to use Web Browser through mobile. Step 2: Login with the username of the account you want to delete and enter the password associated with the username. Step 3: Click on the profile picture shown on the top to the right of search toolbar. If you have not set a profile picture, then you will see a circle enclosed in a rectangle. Step 4:?Once you click on the profile picture, a drop-down list will appear. From among the drop down menu click on Settings. Step 5:?Scroll to the last of settings. 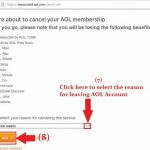 Click on the Deactivate account. Step 6: After you click on Deactivate My Account, a confirmation page will appear containing all the consequences of deleting your account. 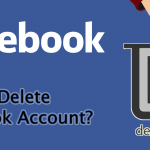 If you are sure about deleting account click on Deactivate option. 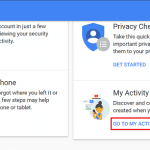 You will be asked to enter the Password for the account you want to delete to confirm that you are the one who is attempting to deactivate the account. Enter it, and you will be out of Twitter. Your twitter account is now deactivated and will be permanently deleted after 30 days. If you change your mind of deleting the twitter account, you can regain it just by logging in again with the existing username and password within 30 days. Keep in mind twitter will store your data only for 30 days after you deactivate your account. 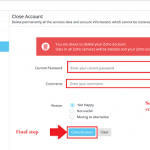 You will be able to use the credentials of the deactivated account to open a new account only after the completion of the said period.